In the first major addition since its current facility was built in 1968, Malden Catholic High School built a new cafeteria wing and redesigned main entrance that transformed its public image. The project doubles the size of the dining area to comfortably seat 325 students and provides expanded kitchen, servery and food service storage. The new construction opened the front facade to provide a contemporary presence at the main door, with large windows for natural light and views from the dining room, and a brick tower to highlight the new entrance vestibule. 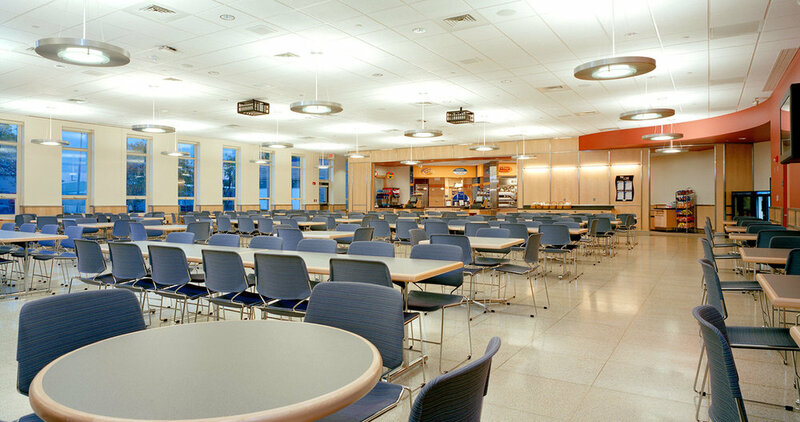 The multipurpose cafeteria is designed to accommodate student meal service with expanded menu options, catered functions, and after-school public bingo. Reconfigured circulation improves the flow of students from the academic core and of visitors from the main foyer, with separated and protected access for food service delivery and trash removal. MDS’ plan allowed for phased expansion and the future construction of a new Fitness Center directly connected to the improved gym complex.